A woman goes to a fortune teller to connect with her dead spouse. Unfortunately for her, she ends up at Wesen fortune teller and Laslo of course woges in front of her, as proof that her spouse visited her. The woman of course because that she has made contact with her husband because she saw the woge and hands over a wad of cash, as Laslo pretends to be weakened by the transformation. The moment the woman leaves, a Maréchaussée enters and woges into a manticore, killing Laslo and his partner Ava. Back to his human self, the Manticore takes a picture of his victims. Juliet talks with Henryetta about her desire to stop being a Hexenbiest. Henryetta tries briefly to talk to Juliet into embracing who she is now but Juliet is only concerned with becoming her true self once again. Henryetta asks Juliet to woge, so that she can see what kind of Wesen Juliet is but Juliet is unsure of how to change. Henryetta tells Juliet that she needs to learn to control her woge because Juliet now has access to a primal force of nature. After Juliet admits that she hasn't told Nick, because she is afraid (okay Gimm, I am going to need some sort of context for this thus far unexplainable fear), Henryetta tells Juliet that she was wise not to because Grimms are not known to be fond of Henenbiests, adding that Nick's natural instinct would be to take Juliet's head off. So Henryetta know this how exactly? Henryetta then takes a sample of Juliet's blood and mixes it with some herbs and potions, then advises Juliet that she will contact her when she has something to share with her. Wu, Hank and Nick arrive at fortune tellers place, where Wu advises Nick that after learning that the victims had large chest wounds and scorpion venom in their system, he went to the trailer to investigate and now believes that they are dealing with a Manticore. Nick affirms that they are indeed dealing with a Manticore, after looking at the bodies of Ava and Laslo. They find the fortune tellers appointment book and decide to visit the last person who they saw. At the station, Reneard checks his email and gets notification that Adalind, Vikitor and Marus Rispoli have landed. Nick and Hank go to visit the the woman that the fortune tellers spoke to the night before. She reveals that Laslo channeled a spirit and changed in front of her. The woman is adamant that she communicated with her husband the night before and expresses shock that the couple was killed. At the Beacon motel, the Manticore - Johnathon Wilde, looks at an image of his deadly work before sending it off via email. The image of the Kurlons and a payment for services rendered is authorized by the Wesen Council. Apparently, along with the images of the Kurlongs, Johnathon also asked for permission to kill Casey Darwell, who has a bounty on him for 20,000 Euros. Johnathon's request is granted. Rosalie and Monroe are back from their honeymoon and of course, Monroe's first question is if he should call Nick to find out if something happened while they were gone. Why is he even curious about this given that he is a newlywed and just got back from an amazing trip? Can we have Rosalie and Monroe actually have something of a life not revolving around Nick and Wesen issues? After Rosalie snarks but ultimately gives the go ahead because she is curious as well, Monroe hunts down his phone. Back at the station, Wu reports that the widow whom the Kurlons spoke to is not a Wesen. Umm dudh. If she was a Wesen she would have not been fooled by a woge. Hank and Nick say that the widow was convinced because she saw Laslo woge, leading Hank to surmise that the Manticore had to show up just after the widow left. The cops question if the Manticore was upset at being faked out because he would have recognized the Kurlons as fake fortune tellers. It's Nick who wonders if this could potentially be a Wesen council thing. When Wu asks what Nick is talking about, Hank explains that not everything is in the books. They are interrupted when Nick gets a call from Monroe. Nick immediately asks to stop by, saying that he needs Monroe's help. When Monroe tells Rosalie that Nick and Hank are coming over, she snarks that it didn't take long. Good for Rosalie but the snark makes me wonder if she is taking over Wu's former role of the giver of snark on Grimm? Viktor and Adalind check into their hotel room and Adalind's comes compete with a wardrobe filled with clothing which Viktor calls reconciliation but makes it clear that he has his own bedroom. Viktor affirms that they did not come this far to return to home empty handed. Back in his room, Viktor opens the door to find Renard. Renard asks about his brother's killer and Viktor says that he has not given up. Renard then asks for Adalind and when Adalind enters the room, Viktor tells them that they need to discuss the future. Viktor says that he underestimated Renard and Renard quickly declares that he does not have his daughter. When Adalind says that Renard gave the child to Nick's mother, Renard replies that he gave the baby to the one person he thought would protect her. Viktor asks what the Resistance will say when they find out that Renard betrayed them and Renard affirms that the Resistance already knows and that he told them that he has no idea where is daughter is, or how to find her. Adalind moves to attack but Viktor hold her off, saying that they are going to keep this civil at first. Viktor makes it clear that neither he or Adalind is leaving without the baby. Viktor and Renard do the back and forth about the royal family and Viktor suggests that Renard think about his relationship with the family the way it is today because those who wanted Renard dead are dead. Nick, Hank, and Wu, arrive at Rosalie and Monroe's and report that they are dealing with another Manticore. Monroe quips that Matinticores are just about impossible to kill. Rosalie suggests that the murder of Kurlons sounds like a hit from the Wesen council because the Kurlons were woging in front of people who are not Wesen. Rosalie and Monroe then bring up a Maréchaussée (Wesen bounty hunter) and suggest that Nick stay out of this, if it is indeed Wesen Council. Nick however believes that he cannot do so because he is a cop, so Rosalie offers to see what she can find out from the council. Juliet is cooking dinner and she decides to practice telekinesis but has to stop suddenly when Nick arrives home. Juliet has to give Nick a ridiculous explanation for how she hurt head. Casey is walking down the street, arguing with what appears to be a prostitute. To settle the argument, Casey woges and threatens the woman, who quickly agrees to do whatever he wants. When the woman walks off, Johnathon confronts Casey, woges and quickly kills him. Johnathon then takes a picture of his handy work. Rosalie calls the council to inquire about the Wesen deaths and if there's a Maréchaussée in Portland. Rosalie is simply told that her request will be reviewed. Monroe now questions if it was a good idea to even ask the Council in the first place. At the station, Nick and Hank continue to work on the Kurlon case but are interrupted by Renard, who wants to seem them in his office right away. Renard tells them about Viktor and Adalind's return and that they are aware that Kelly has the baby. Renard advises Nick to tell Juliet what is going on and that both he and Hank should watch their backs. Juliet is working at the clinic, when she gets a call from Nick to say that Adalind is back in Portland. Nick asks Juliet not to leave work for 30 minutes, so that he can arrive there before her and check it out. Juliet hangs up, slamming her hands on the table in front of her, woges and alarms the animals at the clinic. Nick arrives home and after affirming that Juliet is not yet home, sits down and sends an email to Kelly, informing her that the Royals know she has the baby. Juliet rushes in and declares that if Adalind tries anything, she will rip her throat out and so Nick reminds Juliet that Adalind is a Hexenbiest. Nick checks his email and opens his response from Kelly, who sent along a picture of Diana. Nick gets a call and turns and tells Juliet that he has to go but says that Juliet is to be careful. Rosalie gets a call from the council and is told that she should take no further action regarding her inquiry. The council also acknowledges Roselie's relationship with Nick and Rosalie is told that she will receive a penalty, if she helps Nick in any way. Johnathon sends off an email including an image of his latest victim. Wu, Hank, and Nick, arrive to examine Casey's body and surmise that the Maréchaussée has not left town. Wu reports that the witness claims to have seen the devil in the flesh. Rosalie and Monroe call Nick and inform him of what the council had to say. Nick reveals that they have found another body and asks both Monroe and Rosalie to stay out of it. Monroe warns Nick that he doesn't want to piss off the council anymore than he has and suggests that Nick find someone else to handle this one but of course, Nick is adamant that this is not going to happen. Rosalie tells Nick that a Maréchaussée will not allow himself to be arrested and that killing is his business. The council has made a decision in the matter of Nick, believing that he has interfered once to often. Johnathon is then sent a picture of Nick which contains a bounty of 100,000 Euros. At the station, Wu tells Nick and Hank that the cops found prints on the cell phone found at the scene. They now know Johnathon's identity and it seems that Johnathon has a long list of victims. Wu puts out an APB on Johnathon's known vehicles. Renard hands over everything he has on Kelly to Sam Damerov, adding that most of it is over twenty years old. Renard believes that Kelly didn't go far and asks to be notified when she is found. Sam promises to see what he can do. Before Sam leaves, Renard warns him that Kelly is a Grimm. Nick gets a call from a beat cop reporting a match on Johnathon's motorcycle and he Hank and Wu leave to check it out. Henryetta rushes downstairs to find the mixture of Juliet's blood is boiling over. Hank, Wu and Nick burst into Johnathon's room and arrest him. Nick slams Johnathon against the wall repeatedly, trying to make him woge and has to be called off by Wu and Hank. Back at the station, Hank wonders if they have the wrong guy because Johnathon didn't woge. Nick is adamant that Johnathon is a professional and promises to get him to woge, before heading into the interrogation room. Hank and Wu talk about the fact that all they really have on Johnathon is one finger print. In the interrogation room, Johnathon continues to deny committing a murder and that he is a Wesen. Hank and Nick walk into the station in frustration and meet Wu who has found Johnathon's tablet with the bounty notices and images of the people he has killed, along with billet on Nick. In his cell, Johnathon woges and kills the officer who entered the area to check on him. Juliet looks at herself in the mirror and woges but is not pleased to see what she looks like. Juliet then gets a call from Henryetta asking to see her, so she grabs her coat and leaves. At Henryetta's, Juliet sees the result of the blood experiment Henryetta did and is told that she is very powerful. Juliet is adamant that she does not want this but is told that she is what she is now. Juliet woges and the house starts to shake when she is told that there is no going back. Henryetta slaps Juliet across the face and tells her to get control of herself, pointing out that witches used to be burned at the stake. Juliet stalks out of the house saying no. Nick and Hank talk about the hit that has been put on him by the Wesen council and they are interrupted by Wu, with the news that Johnathon has escaped. Nick decides to rush home because Juliet is there. Nick rushes out of the station calling Juliet to warn her that a man is after him. Johnathon takes the phone away from Juliet and advises Nick that if he wants to see Juliet alive again, he should come alone. Juliet orders Johnathon to get out but she is told that if she behaves herself, she will not get hurt. Juliet picks up a poker and tries to attack but is knocked to the ground. Johnathon woges and starts to attack but Juliet woges and pushes Johnathon's stinger through his chest. When Nick arrives home, he finds Juliet on the couch and Johnathon on the floor dead. Juliet says that she was lucky and that Johnathon missed. Nick apologises and swears that nothing like this will happen again but Juliet tells Nick that only she can protect herself, as she looks at Johnathon's body. News arrives at the council that Johnathon is dead. I for one still don't understand why Juliet is nervous about telling Nick that she is now a Hexenbiest. Yes, Nick is a Grimm; however, he has Wesen friends and interacts with them all of the time without posing a threat to them. Furthermore, Juliet and Nick are in a romantic relationship. I do like that Juliet has determined that she is going to take care of herself because for the longest time on this show, Juliet existed as a victim to be saved. It was nice seeing her as active for a change. One of the things that I enjoyed was Rosalie's snark about Monroe being home a N.Y. minute and needing to contact Nick, to see if anything happened while he was gone. I further enjoyed her snark when she realised that Hank and Nick were coming over. It's about time some dissatisfaction was expressed by the fact that Nick treats them like his go to Wesen, more than he treats them as friends. Yes, it was just two episodes that he came through for Monroe and Rosalie but that doesn't erase the nature of their ongoing relationship. I hope that we see more of this and that Rosalie steps forward to confront Nick about the way that he has a tendency to use Monroe and in fact involve Monroe in things which are dangerous. I also think that Rosalie was right about Nick's involvement with the Maréchaussée. Clearly, the Wesen council was handling their business and though he is a cop, Nick has turned a blind eye to many things in the past and he could have done that with this. It seemed more like his pride in action, than any desire to use common sense. Are we ever going to learn anything about Henryetta or is she just going to be the mystical woo Black lady there to advise Juliet? Given the history of how Grimm has treated WOC who suddenly appear, if we don't learn anything about her soon, it's clear that she will be quickly sacrificed. The story about the Royals and Kelly is heating up slowly. 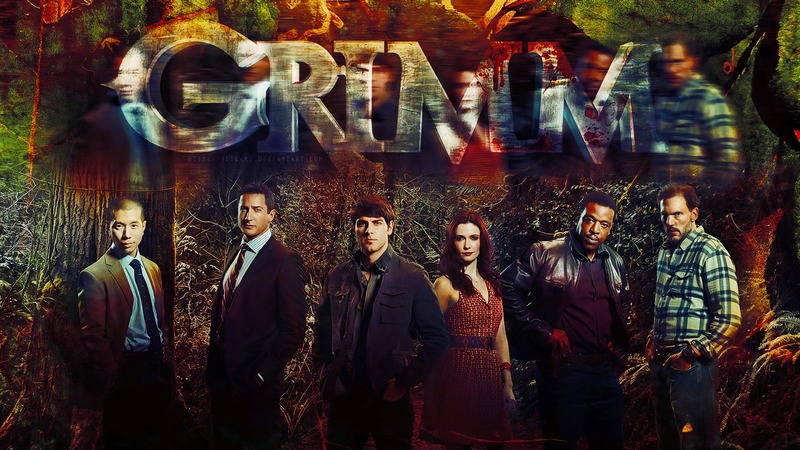 I am going to need Grimm to hurry up because Kelly is easily my favorite character on the show. Bring back Mommy Grimm.